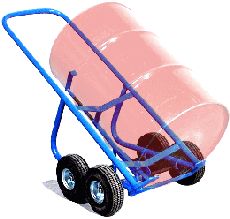 Find the right drum dolly for your 30-gallon (114 liter) drum or 55-gallon (210 liter) drum, and even a pail dolly for that 5-gallon pail (19 liter pail). Standard drum dollies allow you to easily move 55-gallon (210 liter) drum with up to 23" (58.4 cm) O.D. They have a wide stance base with four MORTUF 3" (7.6 cm) polyolefin swivel casters. Use a Morse drum dolly with a plastic, steel or fiber drum. Round Drum Dollies for a drum up to 23" (58.4 cm) O.D. - Typical 55-Gallon (210 liter) drum. See 55-Gallon Drum Dolly dimensional drawing. They have 4 swivel casters that are 3" (7.6 cm) diameter, and 1.25" (3.2 cm) wide. The drum is held 4" (10.16 cm) above the floor. Model 14 Steel drum dolly painted blue. Model 14M Spark resistant drum dolly is made from spark resistant monel nickel-copper alloy. Model 14-SS Type 304 stainless steel drum dolly, ideal for food or pharmaceutical applications. Fasteners are stainless steel. Casters are bright-finished steel with MORTUF polyolefin wheels. Model 14-SSC Like model 14-SS drum dolly, but features stainless steel casters with polypropylene wheels. Model 14-30SS Type 304 stainless steel drum dolly for 30-gallon (114 liter) drum. Fasteners are stainless steel. Casters are bright-finished steel with MORTUF polyolefin wheels. 14 Round Dolly for 55-gallon drum, steel casters with MORTUF polyolefin wheels Up to 23"
(10 kg) L25" W25" H5"
14M Round Dolly with spark resistant parts, for 55-gallon drum, steel casters with MORTUF polyolefin wheels Up to 23"
14-SS Round type 304 stainless steel drum dolly for 55-gallon drum. Has steel casters with MORTUF polyolefin wheels. Up to 23"
14-SSC Round type 304 stainless steel drum dolly for 55-gallon drum. Has stainless steel casters with polypropylene wheels. Up to 23"
14-30 Round Dolly for 30-gallon drum, steel casters with MORTUF polyolefin wheels Up to 20"
(9 kg) L25" W25" H5"
14-30SS Round Dolly, type 304 stainless steel, for 30-gallon drum, steel casters with MORTUF polyolefin wheels Up to 20"
4959i-P Option: Stainless steel casters with 3" polypropylene wheels on any Morse drum dolly. 5666i-P 3" Swivel Casters with Brake on any Morse drum dolly. 24 Clamp+GO TM Dolly Handle 11 Lb. (5 kg) L46" W11" H6"
Flat deck square drum dollies with four rounded corners turned up to hold drum in position for use with your 55-gallon (210 liter) drum. Useful if your drum has a spigot low on the side of the drum. Each dolly has 4 polyolefin swivel casters with 3" diameter and 1.25" wide. The drum is held 3-5/8" (9.2 cm) above the floor. Model 34 square 55-gallon (210 liter) drum dolly. Model 34-SS is a square drum dolly like model 34, but made of type 304 stainless steel. Fasteners are stainless steel. Casters are bright-finished steel with 3" MORTUF polyolefin wheels. Model 34-30 square drum dolly sized for 30-gallon (114 liter) steel drum. Model 34-30SS is a square drum dolly like model 34-30, but made of type 304 stainless steel. Fasteners are stainless steel. Casters are bright-finished steel with MORTUF polyolefin wheels. 34 Square Dolly for 55-gallon drum, steel casters with MORTUF polyolefin wheels Up to 24"
(9.5 kg) L21" W21" H4"
34-SS Square type 304 stainless steel drum dolly,for 55-gallon drum, steel casters with MORTUF polyolefin wheels Up to 24"
34-30 Square Dolly for 30-gallon drum, steel casters with MORTUF polyolefin wheels Up to 19.75"
(8 kg) L21" W21" H4"
34-30SS Square type 304 stainless steel drum dolly for 30-gallon drum, steel casters with MORTUF polyolefin wheels Up to 19.75"
34-5 Square Dolly for 5-gallon pail, steel casters with MORTUF polyolefin wheels Up to 12.5"
(4.5 kg) L21" W21" H4"
34-5SS Square type 304 stainless steel dolly for 5-gallon pail, steel casters with MORTUF polyolefin wheels Up to 12.5"
4959i-P Stainless steel casters with polypropylene wheels on any Morse drum dolly. 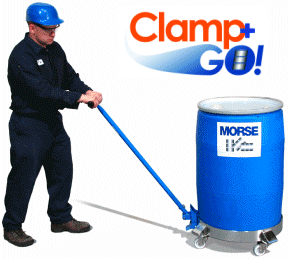 Morse 5-gallon bucket dollies handle up to 12.5" (31.75 cm) diameter can or pail. They have four bright-finished steel swivel casters with 3" polyolefin wheels. PailPRO TM Model 34-5SS is a 5-gallon square pail dolly like model 34-5, but made of type 304 stainless steel. Fasteners are stainless steel. Casters are bright-finished steel with MORTUF polyolefin wheels. Drum Dollies to move and position 30 or 55-gallon drum (114 or 208 liter drum). 5-Gallon pail dolly (19 liter pail dolly).